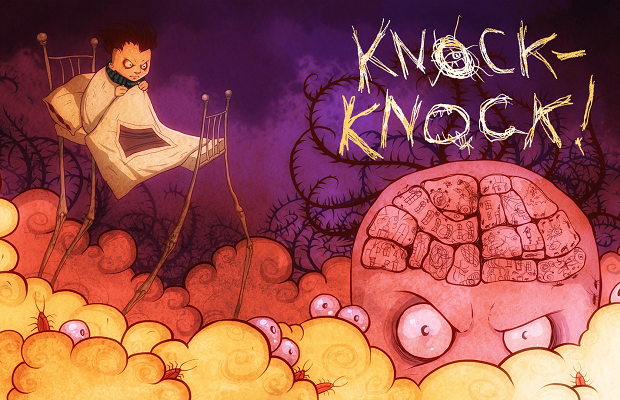 A little over a year ago developer Ice-Pick Lodge launched a Kickstarter campaign for Knock-knock, a very strange 2D puzzler. After surpassing the initial goal of $30,000, the team went about crafting what looked like an eerie game of hide and seek. With a release date still to be determined, the fine folks at Ice-Pick Lodge sent a pre-release build my way. And it comes as no surprise, considering the studio’s history, that the game is more than a little odd. Knock-knock is difficult to parse at first glance. The writing, which is mostly limited to a direct dialogue between the wide-eyed, nameless protagonist and the player, is sporadic and confusing. But as with so many parts of the game, I feel like this might be intentional. From what I could gather as I led about the troubled main character, he lives alone in an estate buried within a dense, Tim Burton-esque forest. Haunted by various apparitions and his own dark thoughts, he wanders throughout the mansion’s darkened rooms, which seem to be in a constant state of change. Days are broken up into stages, and as the days pass, more and more of the hero’s storied past is revealed. The ultimate goal of each stage is then to explore the ever-changing landscape of the house, illuminating rooms as you go and finding items which help speed up time, all in a quest to survive until dawn. Of course, it’s never actually that easy. Nights begin by provoking you with the occasional haunted house tropes of flickering lights, unknown footsteps and slamming doors. But as the finish line approaches, the threats become much more real. Various monsters and other hallucinations will begin to appear and pace around darkened rooms in search of the hero. If spotted, one must flee to a hiding spot, which slowly appear after illuminating a room. If caught, time backtracks a bit, until you eventually have to restart the level. And while I still don’t feel like I fully understand this mechanic, the trappings surrounding it can be somewhat effective. Ice Pick Lodge isn’t afraid to break the fourth wall, as is clear from the get-go with the protagonist, but the studio also plays on this by having the voices in his head talk to him, and subsequently to you the player as well. If a yet unseen foe spots you from a room or two away, you might hear a faint childlike whisper of, “I see you,” or, “now it’s your turn.” While hiding from an aberration skulking about nearby, you might overhear the low guttural voice goad, “come closer, I’m right here.” And this is done so with enough audio distortion that it left me with the occasional chill. These accents create an atmosphere that isn’t in-your-face scary, but can be a lot more creepy than the art style might suggest. As is often the case, some good sound design goes a long way when creating a sense of unease. But at the same time, I found this core mechanic somewhat confusing. There were a few cases where, after going through what I thought were pretty similar runs of a level, a monster would see me, where before they hadn’t. I’m sure there is some internal logic determining this type of thing, and, as said before, this is from an early build, but even now I’m still not sure I fully understand the game’s rules. It left me a bit torn. I wish the mechanics were laid out more clearly, but I fear this might hinder the atmosphere constructed for the game. That being said, Knock-knock is more than interesting enough to warrant a watchful eye. The core feature might not work perfectly yet, at least for my own bumbling self, but the style of horror it strives for is effective. It didn’t leave me screaming, but I did find it delightfully creepy at times.